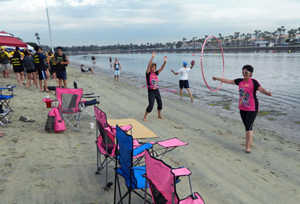 Throughout the year, the LA Pink Dragons engage in a number of activities, both on and off the water. In addition to races, we hold fundraisers, attend community awareness events, and celebrate birthdays and holidays. It was our team’s first visit to this venue and we were thrilled to win gold medals in two divisions. The people and venue were just marvelous! Thank you, Kalispell, Montana. We placed second in both the Breast Cancer Survivor and All Female Cancer Divisions this year at the Long Beach competition. Next stop: Kalispell, MT!